It's hard to remember, but there was a time when a new M. Night Shyamalan film was an event in and of itself. In 2002, at the ripe old age of thirty-two, there might have been no more hotly anticipated film of the year than the director's fifth film, Signs, but what was only his third feature since defining himself as the auteur he seemed destined to be. Fifteen years later and we are in a very different time and space. After the success of Signs (over $400 million globally on a $72 million budget) the studio system continued to only throw more and more money at the writer/director and increasingly his films became examples of trying too hard to do what his first few features had seemingly done with such ease. After 2008's utterly confounding The Happening it seemed Shyamalan might have given up completely as he then resorted to being a director for hire on projects like The Last Airbender and After Earth, but even in these endeavors he experienced some of the more scathing reviews and certainly some of the worst box office returns of his career. Where was the director to go? What was there to do next that might reinvigorate his career? Did this once glorious storyteller that TIME magazine so famously labeled "The Next Spielberg" even care to continue to put forth effort and/or art into the world or was he done? In one way or another it feels like we haven't had the real Shyamalan with us for some time. That the person he was in his early thirties had been lost to the grueling system and there was no certainty as to whether he'd ever come back. In truth, Shyamalan hasn't taken a break longer than three years in between films since 1998 film Wide Awake and those three years came in between Airbender and After Earth. It was only two years after the nepotism on a spaceship tale that was Will Smith's After Earth that we caught a glimpse of who we thought Shyamalan was and might become again. I didn't write about The Visit, Shyamalan's 2015 feature that experimented with the found footage approach, but it was a deliciously pulpy little thriller that not only provided a signature Shyamalan twist that worked with the rest of the narrative, but melded the humor, the uncertainty, and the tension of the situation in ways that felt organic-as if the marriage of story and image were flowing out of the director like they hadn't in some time and this upward trend in quality only continues with Split. Like The Visit, Split is set in a single location and relays a rather simple story in both interesting and horrific ways. It is a portrait of a character and in being that it explores a subject with multiple personalities it might be something of a twisted self-portrait from a director who was labeled as one thing, attempted to remain that thing until he was told he wasn't good at that thing anymore and then tried something else only to fail thus forcing him to re-invent himself once more. From left: Casey (Anya Taylor-Joy), Claire (Haley Lu Richardon), and Marcia (Jessica Sula) are held captive in Split. This could easily be taken as something of a stretch. I can see that, but in both a strange and very earnest way it feels the idea for a film like Split could have very easily come to a man who felt pulled in several different directions while having expectations already attached to his name whether he was making something in his wheelhouse or experimenting with something new. No matter what he might have done there was an inherent fear he wasn't good enough and when you create something that comes from a place of genuine effort, a piece of yourself if you will, and it is immediately trashed and/or dismissed it's not hard to see how one might find it difficult to recover; to co-exist with those you know have already judged you and so what other option is there but to keep re-inventing yourself until you find a facade others seem to take a liking to. Of course, this all depends on if ones inherent personality desires to be liked and admired, but this is straying from the subject at hand. If The Visit was a pilot for a new phase in Shyamalan's career then Split is the darker, more disturbing and much less hopeful second act that is fascinating due to its opposing attitude towards what has been deemed acceptable. In theory, we should like nothing about what Split has to offer in that its main character is a man with a serious mental disorder who kidnaps three young girls to which his objective is never fully clear, but we get the hint he'd like to strip them of as much clothing as possible. Add into this that one of the young ladies, Casey Cooke (Anya Taylor-Joy), has a troubling past and likely a continued path of troubles into her now formative years and there is nothing to necessarily feel good about when walking out of the film. That said, the intent of a horror film is to horrify and Split has the ability to do this in spades. We don't know much about the context of the situation given the film opens at the birthday party of the token popular girl, Claire (The Edge of Seventeen's Haley Lu Richardson) as she, her father, and best friend Marcia (Jessica Sula) wait for Casey's ride to pick her up. When it becomes evident no one is coming Claire's father offers to give Casey a ride setting up a perfect scenario for who we come to know as Dennis (James McAvoy) to kidnap the three girls and take them to his living quarters. We aren't privy to where this underground living quarters is located or what it might be under, we don't know Dennis' intentions, and we don't know what stage of maturity or intelligence these young girls have attained leaving the movie to piece together such pieces to rather terrifying results. Though it is Dennis we initially meet this is only one of the twenty-four personalities that live inside who we come to learn was once a man simply referred to as Kevin Wendell Crumb. In this leading role McAvoy is rather fantastic if not doing anything we didn't already know he was capable of. If you're only familiar with the actor due to the latest series of X-Men films or maybe even Wanted this might be a rather surprising turn, but if you've kept up with McAvoy's range in such campy filth as Trance, Welcome to the Punch, and well...Filth this may not come as much of a surprise. That said, the performance(s) on display here is magnificent and McAvoy more or less chews any piece of scenery he can get his teeth on. From the aforementioned Dennis, a straight-laced blue-collar type with a Northern accent and a pension for dancing women, to Patricia, an older woman who keeps her living space spotless and her sandwiches perfectly cut in half, there is no shortage of personalities waiting within Kevin to try and take the spotlight. The interesting thing Shyamalan does with Split though (and minor spoilers ahead) is make the audience believe this is about bipolar or multiple personality disorder when in reality he means these not to be just different personalities or extreme bouts of depression with alternating periods of elation, but rather different individuals altogether who are simply inhabiting Kevin's physical form as a shell for their existence. They aren't the same person no matter the mindset, they are each a different human being-one left handed, another right handed, one with a higher IQ than another, each with different strengths and weaknesses and they are each well aware of one another. This leads to some fascinating discussions and theories that are tossed out via Dr. Karen Fletcher (Shyamalan regular Betty Buckley) who refers to her patients as if another species altogether. It is mentioned early that Dr. Fletcher seems to have positioned the idea to Kevin that he and others of his kind-or maybe just the many personalities within him-are fighting against a system that can't accept them, but more than fighting against something Kevin is fighting for something; what exactly that is we are unsure. For all the admittedly interesting psychobabble its script spews though, Split more or less rests on the shoulders of McAvoy's performance and whether or not he can convincingly transform into these different people at the drop of a hat. It is in these moments, when we see McAvoy create a flamboyant fashion designer by the name of Barry or a nine year old troublemaker by the name of Hedwig and transition from one to the other seamlessly that not only is the film completely enrapturing, but it can be downright stomach churning given the circumstances Shyamalan has placed these characters in. 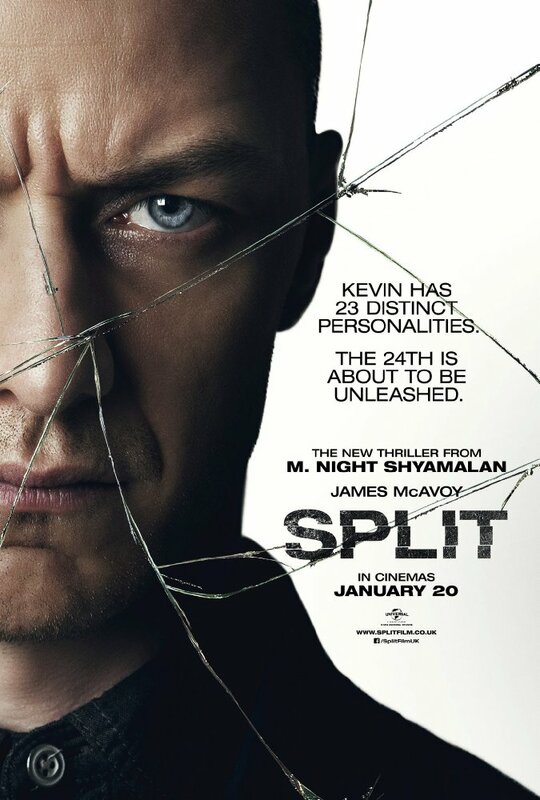 James McAvoy embodies two dozen different personalities in the latest thriller from M. Night Shyamalan. What serves as both a comment on his most recent work as well as the trajectory of his career as a whole is also the filmmaking style the director uses here. Shyamalan, though obviously accomplished, never had a signature look of his own, but rather after The Sixth Sense and in those next four or five films the aesthetic was more prestigious rather than anything especially singular. There was a scope to his projects, but not necessarily anything striking that would signal to an avid cinephile that this was an M. Night Shyamalan movie. Shyamalan left this distinction more in his conveyed tone than visual style, but as with The Visit in its approach to the found footage genre Shyamalan has approached Split with cinematographer Mike Gioulakis (It Follows) and there is very clearly an intentional and carefully crafted visual approach to be noted. Given the film mostly takes place in the confined spaces of small rooms and cluttered offices there isn't much in the way of design to work with and so the film utilizes both the framing and the movement of the camera to relay its visually interesting ideas. Much of the time the camera remains stationary in the same spot the scene opened in no matter how much the characters move within the scene. The camera simply continues to pan as characters walk across a room with the frame not being bothered with whether it cuts off heads or legs. Other times the camera is not only stationary in its placement, but in its framing. A sequence in which the Hedwig persona, the nine year old boy who likes to dance to Kanye West, takes Casey to his room to show her his CD player and proceeds to show her a few dance moves perfectly encapsulates the comically twisted sensibilities of the film, the tour de force performance McAvoy, as well as the sheer terror Casey must be feeling as we experience much of the film from her perspective. All of this is captured in a single, static shot that is effective due to the fact it lets the elements prove their worth in their own capacity rather than forcing the camera to pull something out of those elements that might not be there. Speaking of Casey, it should be noted that Joy is rather exceptional in her role as well. McAvoy will garner the greater amount of attention for his more showy role and rightfully so, but Joy's Casey is required to convey a lifetime of experiences largely through quiet looks and empty stares and she never fails to communicate what the character is thinking and feeling. 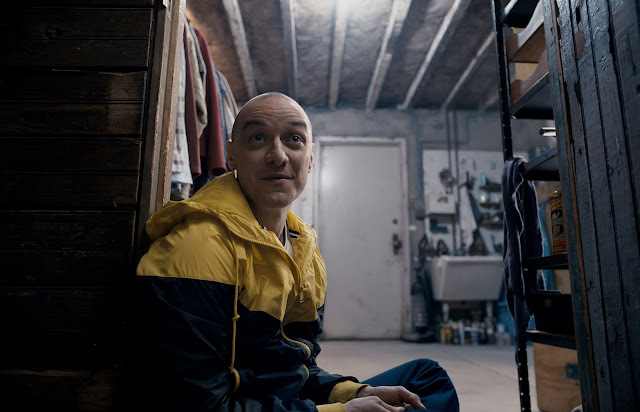 Split hints at themes dealing in the value of life, the purity of innocence versus experience, and the limits of what a human being can and should become-all of which are interesting facets the film decides to let simmer rather than address outright, but if you stay through the tag on the credits you might just get a hint of what conclusions Shyamalan might draw and though it may not be a "twist" in the traditional sense it is truly both satisfying and shocking.